Variegated Fritillary is a regular temporary colonist, arriving in Massachusetts from its year-round range further south. It was seen in the state quite often historically, and in recent years has appeared every year during the summer season. It seems to be appearing earlier in the last 25 years than it did historically. Reproduction is attempted, but there is no evidence that Variegated Fritillary successfully over-winters. Our other large fritillaries – Great Spangled, Aphrodite and Atlantis – are all in the genus Speyeria. Variegated Fritillary, Euptoieta claudia, differs from the Speyerias in several key respects: it has multiple yearly broods, rather than one; it uses multiple host plants rather than solely violets; and it is migratory and wide-ranging rather than localised (Cech and Tudor 2005). Connecticut River Valley: Amherst, H. W. Parker, Aug. 3, 1874 (Psyche I, 7: 26). Central Massachusetts: Leominster, Shurtleff, midsummer, n.d. (Scudder 1862). This is the earliest known report. Worcester area, W. T. M. Forbes, Aug. 1900 (Psyche I, 7: 134). Eastern Massachusetts: Attleboro, W.W. L. Mason, Aug. 3, 1878 (Psyche II, 64: 258; specimen in MCZ); Cambridge, Folsom n.d. (Scudder 1899); Chelsea, P. S. Sprague, n.d. (Scudder 1899); Malden, Seale 1882 (MCZ specimen in Sprague Collection), F. H. Sprague, 4 specimens in Sept and July, 1883 (Scudder 1889), and Holbrook, July 29, 1900 (Boston Univ. ); Medford, Rogers, c. 1906 (Psyche XIV, 3: 63); Newburyport, C. J. Maynard and Hayward, several specimens in autumn 1883 (Maynard 1886), L. W. Swett, Aug. 30, 1908, (Boston Univ. ); Wollaston, F. H. Sprague, July 15, 1899 (MCZ specimen); Canton, W. F. Eastman, July 13, 1912 (MCZ specimen). Then, as now, Variegated Fritillary could apparently be found almost anywhere around the state, but was particularly likely in eastern Massachusetts. The year 1883 saw an unusually large flight into the state. Very few of these early specimens seem to have survived; none are in the Harvard MCZ, for example. By 1934, Farquhar is able to add Salem, Rowley, and Magnolia north of Boston, and Holliston, Fall River, and Wareham to the south, to the list of Massachusetts towns where Variegated Fritillary had been found. Also, larvae had been found on July 19 in Holliston, and September 5 in Fall River, and both had matured to adults after a few weeks, so that Farquhar concluded that this species “apparently breeds here occasionally but is probably unable to withstand our winters” (Farquhar 1934: 301). This characterization still holds today. Variegated Fritillary had been found on Nantucket by the 1940’s by Charles Kimball: at Surfside on Sept 23, 1940 and at Waqutuquaib Pond on August 7, 1941. At least one specimen is in the Maria Mitchell Museum on Nantucket (LoPresti 2011). But this species had not turned up on Martha’s Vineyard (Jones and Kimball 1943). For Berkshire County, the MAS Atlas mentions an historical specimen in the collection of R. Wendell, but this probably dates from after 1950. The North Shore has historically been a good location for late summer Variegated Fritillaries. There is a specimen from Nahant dated August 1929 at Boston University. In 1966, James P. Holmes, an Essex County collector, reported that Euptoieta claudia was fairly common for the second year in a row at Gloucester, Mass. at Goose Cove Reservoir. He took a female at Rockport on the early date of June 20, 1966, and another female on July 31 that year (LepSocSeasSum 1966). It is surprising that there are apparently no reports or specimens from Cape Cod until the 1980’s. The first specimen seems to be that of Mark Mello, taken on August 19, 1981, at Hatches Harbor, Provincetown (LepSocSeasSum. 1981). In Massachusetts Variegated Fritillary probably uses mainly various species of violets and pansies (Viola spp. ), but other larval host plants are possible, given the wide range of hosts reported throughout its range. The use of lance-leaved Violet (V. lanceolata) was observed by T. Dodd around Wachusett Reservoir in Massachusetts in the 1990's, and this plant is also abundant around lakes such as Quabbin Reservoir and in wet meadows across the state. The use of garden herbs, specifically cultivated thyme (Thymus) has been reported by M. Mello for Cape Cod (Atlas; Mello and Hansen 2004). MBC members have observed ovipositing on butter-and-eggs (Linaria vulgaris). In other regions, reported host plants for Variegated Fritillary are passionflower (Passiflora spp. ), flax (Linum spp. ), stonecrop (Sedum spp. ), and plantains (Plantago spp.). Other species sometimes used include moonseed (Minispermum canadense), purslane (Portulaca), and mayapple (Podypyllum peltatum). Cech (2005) refers to this species as a “generalist,” because of its multiple host plants and habitats and wide-ranging migratory behavior. 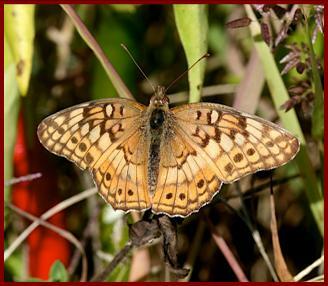 NatureServe (2012) observes that Variegated Fritillary is an “opportunistic transient breeder,” utilizing virtually any open to sparsely treed habitat. It is found in grasslands, meadows, and on coastal sand dunes. It is quite tolerant of disturbed situations, including old fields, gardens, suburbs, vacant lots, and orchards, as long as the host plant and some nectar sources are present. One Massachusetts reporter observed ovipositing on violets growing in sidewalk cracks in a suburb -- hardly the most safe or suitable habitat. The only habitat Variegated Fritillary does not appear to use is forests, so that this butterfly species, like many others, undoubtedly benefited from the land clearing for agriculture which took place in the state from 1600 onward (Table 1). Variegated Fritillary's year-round habitat appears confined to the southern coastal plain (Opler and Krizek 1984), but its secondary, or expansion range extends into Canada in the central part of the continent (Layberry 1999). This species is classed as a “rare temporary colonist” in Maine (Maine Butterfly Survey http://mbs.umf.maine.edu ). Nature Serve (2012) cautions that for migratory and transient butterflies such as this, a breeding occurrence should not be confused with an ongoing population or colony. Granted, but there are some locations in Massachusetts which have hosted breeding Variegated Fritillaries year after year, such as Northampton community gardens and the edges of Wachusett Reservoir until succession set in. The butterfly seems to find its way to these favorable spots for many years in a row. While the 1986-90 MAS Atlas found Variegated Fritillary “rare to uncommon,” summation of MBC records 2000-2007 finds it to be on the lower end of “Uncommon” relative to other species (Table 5). It is definitely not Rare. With a least a few being seen in every year 1992-2013, it can be classed as a regular immigrant during these years. As Chart 39 shows, numbers seen relative to trip reports show fluctuation from year to year, but the years 1999 and 2000 had particularly large incursions. No overall trend of increase or decrease can be seen in these data, although there is obviously a decrease following the two high incursion years. However a separate analysis of MBC data 1992-2010, using list-length as a measure of effort, finds that detectibility of Variegated Fritillary decreased a statistically significant 58.5% over this time period (Breed et al. 2012). The two peak years of 1999 and 2000 were also the years with the earliest and the latest sightings (see below). Especially large numbers were reported on the North Essex NABA Count in 1999 and on the Bristol, Foxboro, and Northern Worcester NABA Counts in 2000. The downward trend since the peak has apparently continued through 2013. Whereas over 100 individuals (226 in 1999, 177 in 2000) were reported in the incursion years, and some 20-50 in the years 2006 and 2007, only about 18 individuals were reported in 2011, 9 in 2012, and 8 in 2013. 2011 was still a fairly strong year for Variegated Fritillary in the state, with individuals arriving as early as May 28 in Whately (B. Benner) and May 30 in Uxbridge (T. and C. Dodd). Individuals were seen ovipositing on johnny-jump-ups in Whately in May, and on violets in Medford in August (R. LaFontaine). Variegated Fritillary could turn up almost anywhere around the state, and has been seen in 95 out of 315 towns 1992- 2013. Eight new towns were added in 2011: Andover, Beverly, Hadley, Leicester, Medford, Newburyport, Norfolk and North Andover, but none in 2012 or 2013. In this time period Variegated Fritillary has been reported from all towns on Martha’s Vineyard -- Aquinnah, Chilmark, Edgartown, Tisbury, Oak Bluffs and West Tisbury. There had been no historical or Atlas reports from the Vineyard, and the first report is apparently a 9/13/1994 specimen collected at Gay Head by P. Z. Goldstein (Harvard MCZ). The next earliest is a sight report, 9/11/1998, Edgartown Katama Plains, M. Pelikan. The 2002 Vineyard Checklist still terms it “rare” on that island (Pelikan 2002), but multiple sightings since then indicate a need for reassessment. From Nantucket there have been no Atlas or MBC period reports, but in view of the historical records Variegated Fritillary is a good possibility there (LoPresti 2011). Like many coastal migrants, Variegated Fritillary often appears on islands. It has been reported from Cuttyhunk and Penikese Islands (Gosnold), from the Boston Harbor Islands (Spectacle Island, 1 on 10/12/2008 T. and C. Dodd), and from Monomoy Island in Chatham (7 on 9/20/1998 B. Nikula and J. Trimble). In Berkshire County or nearby, there are MBC reports from Adams, Charlemont, Heath, New Ashford (Mt. Greylock), Pittsfield, Savoy, Sheffield, Williamstown and Windsor. The 1986-90 MAS Atlas had no reports from Berkshire County, but cited at least one specimen in the R. Wendell Sr. collection. Variegated Fritillary is most often seen as single individuals, but there have occasionally been population buildups in suitable locations. The largest report so far comes from 1989 during the Atlas period, when a large colony built up around the shores of Wachusett Reservoir, in the towns of Clinton, Sterling and West Boylston (Worcester Co.). This concentration was studied by Tom Dodd, who first noticed a Variegated Fritillary there on 7/2/1989 and made nearly weekly counts thereafter. There were two or three generations, and the high count was on 30 September 1989, when Dodd and Stan Bolton counted 162 adults and two larvae in two different areas around the reservoir. The last individual was seen there on 11/14/1989, the latest date known at that time. The next largest report comes from the boom year of 1999, when 27 were counted on 8/31/1999 at Wenham Canal by F. Goodwin. Cape Ann , 4 on 7/6/1999, D. Savich and C. Tibbits; Chatham Monomoy Island, 7 on 9/20/1998 B.Nikula and J. Trimble; Clinton/Sterling 6 on 7/28/1996, T. and C. Dodd; Hadley, 2 on 7/17/2011 B. Benner; Halifax/Hanson Burrage Pond, 3 on 7/23/2009 J. Sweeney and V. Zollo; New Ashford Mt. Greylock, 1 on 6/5/2013, S. Moore, S. Cloutier; Northampton community gardens, max. 6 on 10/14/2007, F. Model and B. Spencer; Plymouth Tidmarsh Farms, 3 on 6/30/2012, S. Stichter et al. ; Quabbin area, max. 13 on 9/29/2002, T. Gagnon; Rockport Waring Field, 4 on 9/19/1999, T. and C. Dodd; Royalston, 4 on 9/13/2004, C. Kamp; Springfield Forest Park, 2 on 8/5/2000, T. Gagnon et al. ; Uxbridge West Hill Dam, 3 on 9/20/1999, T. Dodd; Ware Klassanos property, 2 on 9/2/2009, B. Klassanos; West Boylston, 5 on 8/28/1994, T. Dodd; Westport Gooseberry Neck, 4 on 10/20/2000, R. Hildreth; Williamstown Mountain Meadow TTOR, 1 on 7/7/2011, P. Weatherbee. One hundred years ago, Scudder did not know of any Variegated Fritillary reports in Massachusetts earlier than July, and there are no turn-of-the-century museum specimens earlier than July. There is one 1960’s literature report of a June 20, 1966, specimen from Gloucester (see above). Today, however, Variegated Fritillary has arrived in some years as early as the third week in May, possibly indicating a trend toward earlier arrival due to climate warming. Peak numbers are still found, however, in late August, September and even October (http://www.naba.org/chapters/nabambc/flight-dates-chart.asp) according to MBC records. If adult Variegated Fritillaries arrive by mid-July, they have time to successfully complete a life cycle here, producing a second flight of adults which would augment the end-of-season surge in sightings. There may even be a third brood at this latitude during good years (Atlas account). However, no life stage has been known to survive the winter here. Numerous reports of ovipositing, eggs, and larvae attest to the species’ attempt to reproduce here. Still, it is surprising that there are not more reports and photographs of the striking orange caterpillars and the white chrysalids. The records contain the following reports: two larvae at Wachusett Res. 9/30/1989 T. Dodd; chrysalis photographed, Northampton community gardens, 10/3/2004, T. Murray and 10/1/2004, B. Benner; female ovipositing, Northampton community gardens 10/10/2006, F. Model; ovipositing on johnny-jump-ups in Whately, 5/28/2011, B. Benner; ovipositing on violets in Medford 8/1/2011, R. LaFontaine; ovipositing on ground, Northampton community gardens, 9/19/2012, Tor Hansen (photographed). The MBC website http://www.massbutterflies.org has a photo of mating, taken 7/13/1999, Quabbin, D. Small. Earliest sightings: In the 23 years of BOM-MBC records, 1991-2013, the six earliest "first sightings" are 5/22/1999 Tisbury, B. Cassie; 5/27/2000 Mt. Greylock, T. Fiore; 5/28/2011 Whately, B. Benner; 5/29/1991 Foxboro, B. Cassie [also cited in the MAS Atlas]; 6/1/2002 East Bridgewater, E. Giles; and 6/1/2009 Royalston Tully Dam, C. Kamp. The two earliest sighting records 1991-2013 occurred in the peak incursion years of 1999 and 2000. These May and June dates are obviously much earlier than any of the 19th century reports, the earliest of which was July 13 (see above). The earliest known date in the 1960's was June 20, 1966 in Essex (see above). There may be a long-term trend toward earlier arrivals. Latest sightings: The five latest "last sightings" in these 23 years were 11/21/1999, Quabbin Res., T. Gagnon; 11/21/2000 Hingham World’s End, D. Larson; ; 11/1/2004 Northampton community gardens, T. Gagnon; 10/25/2007 Northampton community gardens, T. Gagnon; and 10/24/2008 Kingston, T. Murray. The latest two sightings occurred in the population boom years of 1999 and 2000. The Atlas period late date was also in November: 11/14/1989 Wachusett Res., T. Dodd. There are no historical turn-of-the-century or even pre-Atlas specimens later than September. (The latest known to the author are 23 Sept. 1940, Nantucket, C. Kimble and 25 Sept. 1981, Holliston, W. Kiel [LSSS 1981].) There may therefore be a trend toward extending the end of the flight period later and later into the year. Variegated Fritillary seems to have been arriving earlier and possibly more frequently in Massachusetts than it did a century ago, and flying for a greater length of time. The explanation for these changes is the warming of the climate, and this species might be expected to increase here as a result of climate change (Table 6). However, increase has not been evident in this species since the peak years of 1999 and 2000. In Connecticut Variegated Fritillary had likewise become "a more regular migrant” in the 20 years prior to the 1995-90 Atlas. Of the 14 pre-project records, over half, or 8, were from 1990-1994. The species was recorded every year during the project, and just afterward (O’Donnell et al. 2007). But it may be a mistake to assume that the 1999-2000 peak years in either Connecticut or Massachusetts will occur frequently going forward. Maintaining suitable habitat for migratory and transient butterflies such as this one is just as important as for resident, over-wintering species. For Variegated Fritillary open habitat with suitable violets should be preserved.